So far, when compared with some of the nights in October, November hasn’t been that cold. Today was nearer the November norm – chilly, misty, drizzly and, with the leaves now mostly off the trees, just a little bit dank and dismal. November, however, does begin to offer beautiful citrus fruit: gorgeous big lemons; neat punchy little clementines and later in the winter, bitter Seville oranges for marmalade and puddings. 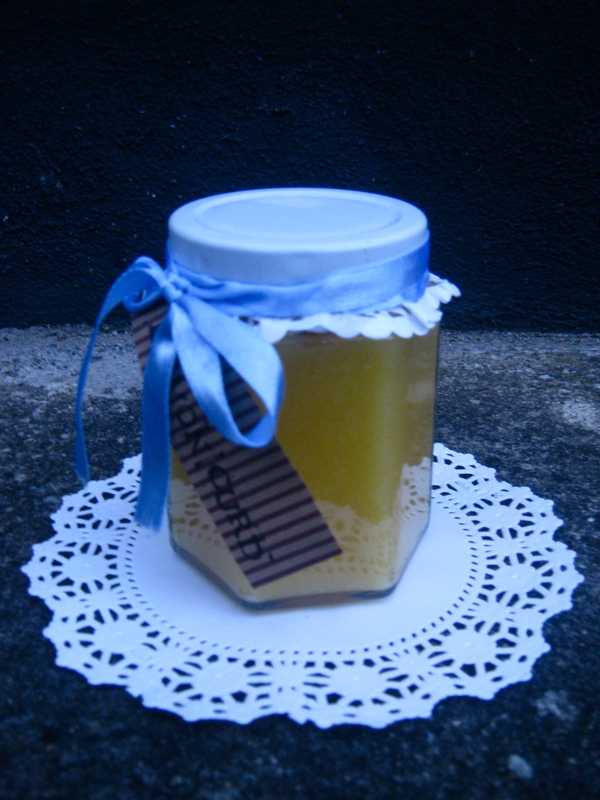 Lemon curd is the perfect antidote to inclement weather and dark skies – it could be jarred sunshine. I made a small jar this afternoon and I was surprised at how easy it is to make. Having successfully made lemon curd, I’m now keen to try passionfruit curd and a Seville orange curd. Zesty and creamy, it’s lovely for afternoon tea on fresh bread, plain scones or with sponge cake. It would also be great with meringues and whipped cream or incorporated into a cupcake topping. Lemon curd is only as good as the ingredients you use, so try to find unwaxed lemons and use free range eggs if you can so that the yolks have a nice bright colour. Room-temperature lemons will produce more juice, as will rolling them on a counter with the palm of your hand for a minute. The lemon curd will thicken slightly more as it cools. I made mine with an improvised bain marie, which is not strictly necessary. However, warming the curd in a bowl over water gives you a greater control of the temperature: the curd should not come to a boil or it could split. – Put the butter and sugar into a heat-proof bowl and place over a saucepan with about 1.5 inches of water in it. Gently bring the water to a simmer under the bowl, stirring the butter and sugar till the butter has melted and the sugar has dissolved. Using the smallest-holed microplane grater you have, zest only the very top layer of the lemons. The zest should be very fine as it should dissolve in the curd rather than being apparent afterwards. Juice the lemons and pour into the bowl, ensuring that no pips enter the mixture. Continue to warm through. Add the beaten egg yolks and whisk regularly. Bring the water below up to a boil and make sure the pan has enough water in it. Heat a glass jar in a hot oven for about five minutes to sterilise it. Cook the lemon curd for about 15 minutes, or until your finger leaves a lasting path in it on the back of a spoon. It should be thick and custardy when you take it off the heat. Pour into your jar. It should keep for about a fortnight in the fridge.